In some wind tunnel tests, the model is instrumented to provide diagnostic information about the flow of air around the model. Diagnostic instrumentation includes static pressure taps, total pressure rakes, laser Doppler velocimetry, and hot-wire velocity probes . A diagnostic test does not provide overall aircraft performance, but helps the engineer to better understand how the fluid moves around and through the model. Depending on the type of instrumentation used in the experiment, steady state flow or unsteady, time-varying, flow information can be obtained. On this page, we will discuss the operation of the hot-wire velocity probe. As the name describes, a hot-wire probe is nothing more than a very thin wire that is inserted into the flow at the end of a probe. The left part of the figure shows two hot-wire probes with a centimeter ruler to provide a sense of scale. The diameter of the wire is approximately 10-4 cm. Electricity is applied to the wire which generates heat due to the resistance in the wire according to Ohm's law. The heat is carried away from the probe by the flow of air and the heat transfer is proportional to the velocity of the flow. Using a feed back circuit, either the temperature of the probe or the current through the probe can be held constant. The measured voltage across the system is proportional to the velocity at the probe tip. Calibrating the probe for a known velocity, the probe can then be used to measure the velocity at the probe tip. Because the wire is extremely thin, the response to changes in velocity is very fast (~50kHz), and the probe can be used to measure unsteady, turbulent flows. There are several problems to be considered when using hot-wire probes. The probe is inserted into the flow, so there is always a concern that the probe alters the flow that we are attempting to measure. A laser Doppler, or LDV system is superior in this regard; LDV is non-intrusive. However, hot-wires are much less expensive than LDV systems. Hot-wires are also extremely fragile because of the thin wire. If the flow in the tunnel is dirty, the risk of a broken wire is high. 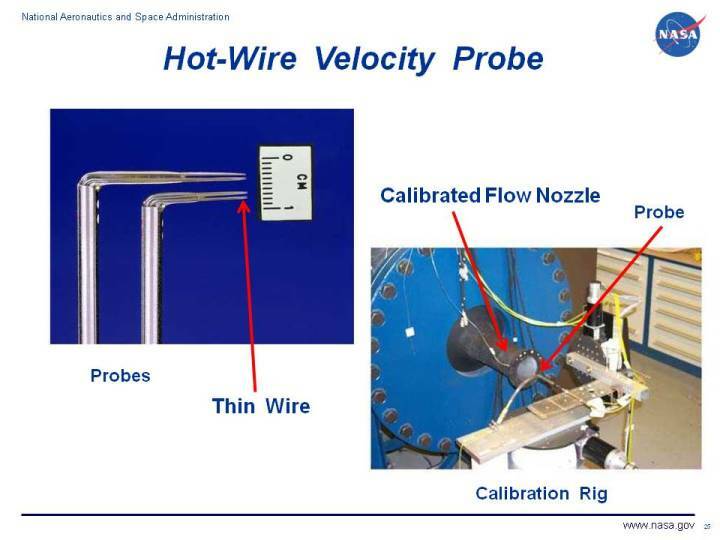 Hot-wire probes must be calibrated before use in a wind tunnel. At the right of the figure we show a calibration rig. Air is made to flow throw a nozzle which has been tested by the ASME to deliver a known mass flow rate with a known flow coefficient. The velocity in the center of the jet is therefore known. By correlating this velocity to the measured voltage across the probe, we have calibrated the probe for use in a tunnel test.